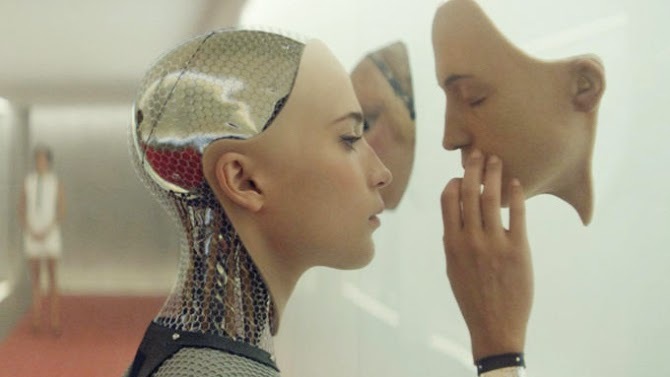 Ex-Machina opens in limited release in Australian cinemas on May 7 and is distributed by Universal Pictures. Ex-Machina puts a new spin on the ever present cinematic contemplation of artificial intelligence. While it is an intriguing and original notion of the creation and complexities of an AI, it's execution is rather dry due to it's lack of emotional strength and power to promote further thought. After winning the chance to participate in a social experiment at the enigmatic Nathan's (Oscar Isaac) isolated retreat, Caleb (Domhnall Gleeson) find's himself face to face with Nathan's creation of an AI. 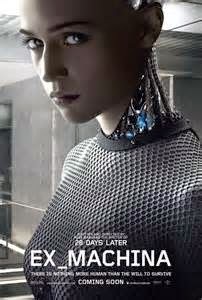 To Caleb's astonishment, he finds that this AI comes in the form of a beautiful young woman by the name of Ava (Alicia Vikander) who he is drawn to instantly. He forms a bond with Ava and when she feels that she can trust her new friend, she warns him about Nathan's intentions and makes him realise that he may be a very dangerous man. Alex Garland's Ex-Machina is a particularly well made film with an original idea moulded around a concept that has been seen in many a science fiction movie in the past. The film absolutely knows who it is and has a true identity of it's own both in narrative and in appearance. The story is intriguing and even though it is of a slow pace and lacks in intense suspense, it remains clever, witty and unpredictable. The aesthetics of the film match the story. The setting of Nathan's remote house which doubles as a research facility is brilliantly designed not only from a production point of view, but also because it almost plays a role in the film with how much character it has. It adds towards the uneasy and claustrophobic atmosphere of the film with it's disconnection from the rest of the human race and the realisation of the secrets it holds. The CGI that is in place of a true body for Ava is rather stunning and completely intriguing, along with the sound effects that accompany her each and every move. However, it is what Ex-Machina doesn't do rather than what it does do that is frustrating. While the film has some interesting themes such as reality vs. simulation and looks at the negatives involved with the creation of artificial intelligence, it doesn't encourage further thought from it's viewers and one gets the feeling that it does intend to. The film doesn't promote further contemplation of it's themes which is something it is felt it should do considering it's complex and daring ideas. However, it is the lingering thought and the lack of desire to think further that is present and rather disappointing. Emotionally the film feels as sterile as the facility which it is set in. This seems partly intentional by Garland, but many people want to be stirred by the film they see in some sort of way and they feel cheated if they are not. There is a desire for Ex-Machina to make one feel some sort of emotion such as anger or suspense, or feel something for one of the characters, but alas this is a need that is unfulfilled. Alicia Vikander is a superb choice to portray Ava. Her face radiates with the innocence that is called upon for someone who has only been on this Earth for a short while and it is an innocence that makes her seem perfectly trustworthy and likable. Vikander's performance is certainly a very subtle one, but very interesting and memorable. Of the three main characters, she is perhaps the most likable and it is understandable how Caleb is drawn so quickly to her. Domhnall Gleeson does well enough as Caleb, but he doesn't come across as all that likable and his true feelings for Ava are assumed rather than shown. Oscar Isaac is certainly interesting as Nathan. He is indeed charismatic, but also very enigmatic and mysterious as one is never quite sure what his intentions are and how he really feels. The question that does follow him throughout the film is whether Nathan is really the bad guy, and this is an enjoyable question to ask while it lasts. Ex-Machina may be a fine looking film with an originality that is craved in it's genre these days, but it doesn't provide a lingering presence that is craved in cinema. It does not force you to feel or think, which is what you want it to do and what the film itself wants you to do.